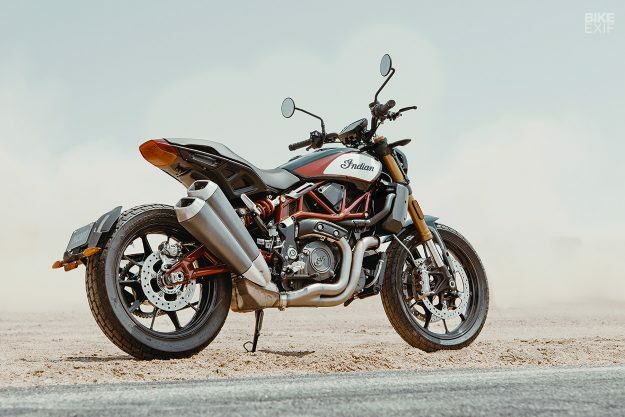 Indian has finally revealed details of its production street tracker, the FTR 1200—the most hotly anticipated bike launch of recent months. 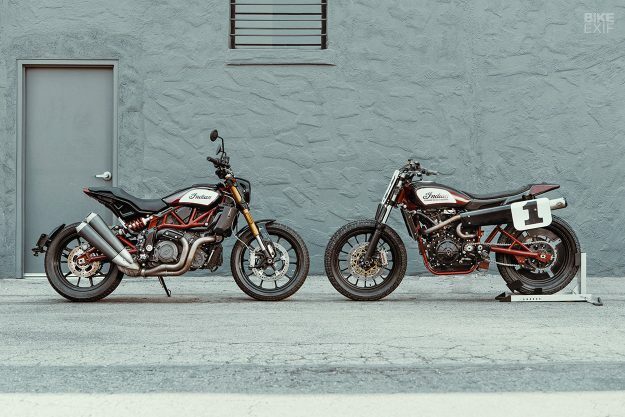 The good news is that the FTR 1200 sticks fairly close to the styling lineage of the all-conquering FTR750 flat track racer, and the FTR1200 Custom concept bike we reported on last November. The seat is also bigger than the perch on the concept bike, with passenger pegs down below, and the back wheel has gone down a size from 19 to 18 inches. 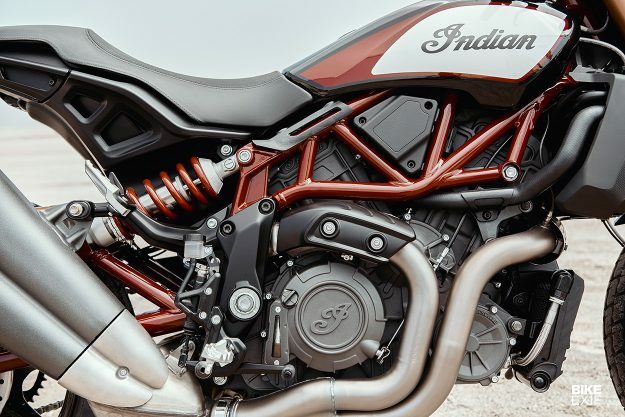 But overall, we’d say that Indian’s design department has done a good job in navigating the ever-increasing maze of global regulations. But is it a game-changer? Let’s get down to the nitty-gritty to find out. What are the models and prices? There are two just models for now. The base FTR 1200 comes in basic black (above) and will retail at $12,999 in the US. That’s $1,700 more than the Forty-Eight and Roadster Harley Sportsters. 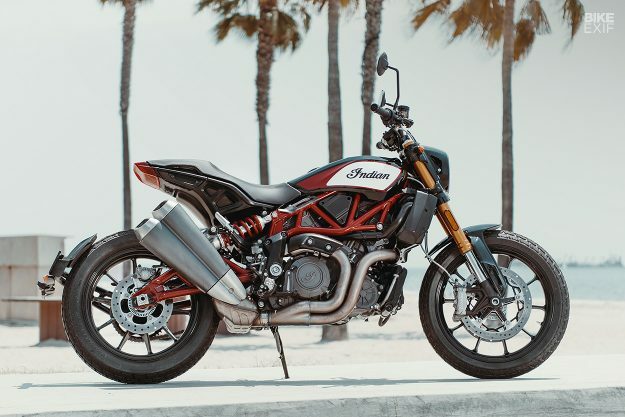 The up-specced FTR 1200 S comes in red and gray (below) or titanium and black paint, and will sell for $14,999. So it’s just $500 more than the Harley-Davidson Street Bob, the cheapest model in the Softail range. For European buyers, the prices will be EUR 14,690 and EUR 15,990. There will also be a ‘race rep’ version of the S, with a red frame, which will sell for $15,999 and EUR 16,590 (below). 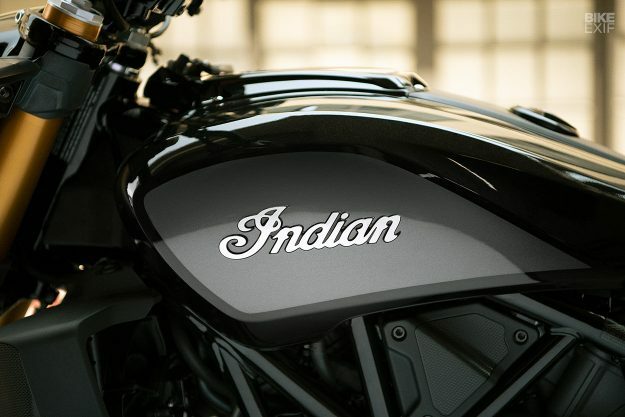 This is the hero bike that Indian is using for most of its PR shots. (73 cu in) V-Twin engine. It’s a fractional, yet somehow symbolic, single cubic centimeter larger than Harley’s Sportster 1200 motor. The motor is a DOHC with 4-valves per cylinder, and a 12.5:1 compression ratio. It’s an over-square design, with a bore and stroke of 102 mm x 73.6 mm. Although it’s related to the Scout engine, around 80% of the components are new and the crankshaft is ten pounds lighter. There are ‘high flow cylinder heads’ and dual Mikuni throttle bodies, plus a low-inertia crankshaft. Magnesium is used in the engine covers to reduce weight. 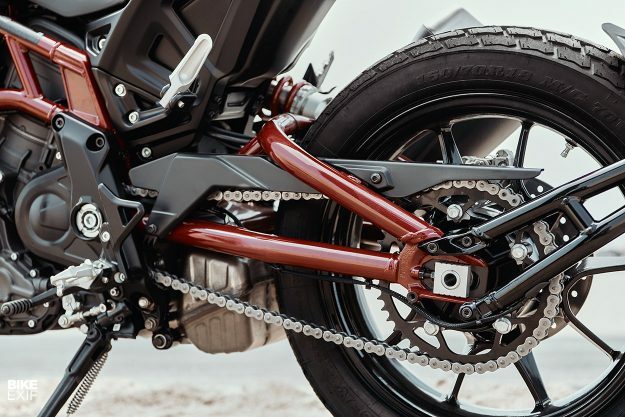 Power feeds through a six-speed box with a slipper clutch, and hits the back wheel via chain drive. What about the chassis and brakes? Both models have 43mm Sachs USD cartridge forks and 320 mm dual disc Brembo Monobloc 4-piston front brakes. The gold forks on the 1200 S are adjustable for preload, compression and rebound. Rake and trail are 26.3° and 130 mm for both FTRs. The swingarm takes after the one on the FTR750 race bike, and features a side-mounted monoshock. On the base FTR 1200 this has preload and rebound adjustments. 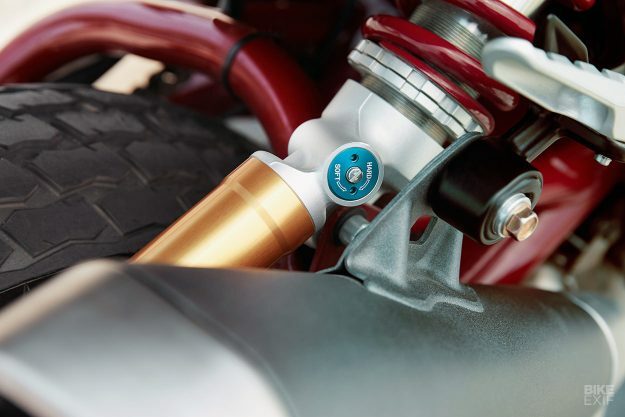 On the S model, the monoshock also has a piggyback aluminum reservoir and is adjustable for compression too. Suspension travel is 150 mm, front and rear, and the lean angle is a respectable 43 degrees. Seat height is a somewhat lofty 840 mm. The cast aluminum ten-spoke wheels are F19/R18, and shod with Dunlop’s new DT3-R radial tires, which mimic the tread pattern of flat track rubber. Are there any rider aids? 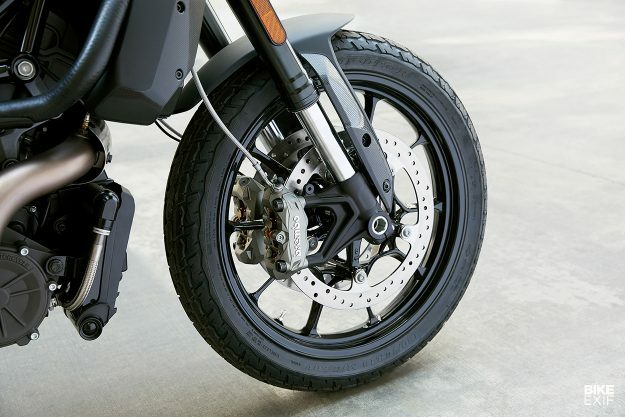 ABS is standard, and the FTR 1200 S electronics package also includes stability, traction, and ‘wheelie mitigation’ control with an inertial measurement unit. 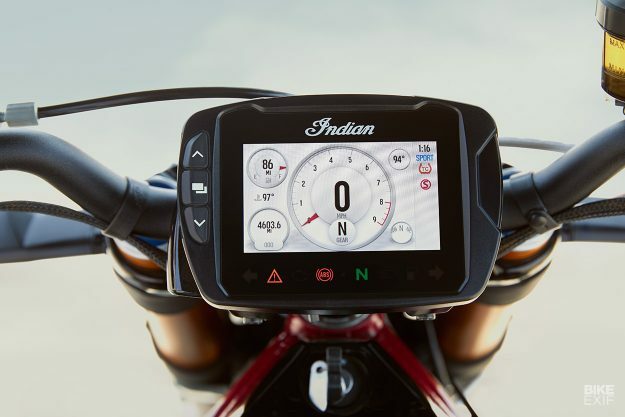 control can be customized further to suit the rider’s preference. Both models have built-in USB chargers. 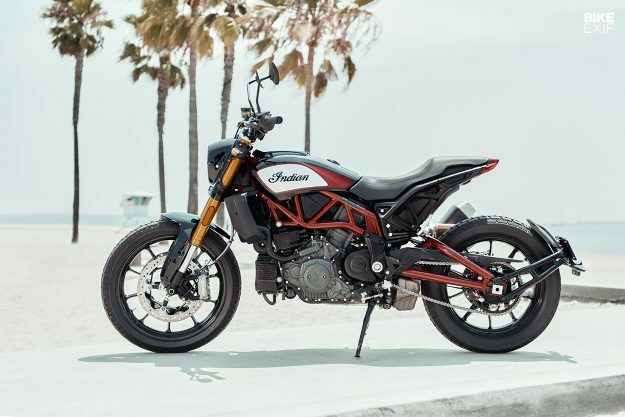 Dry weight is listed as 221 kilos (487 pounds) for the base model, and a kilo more for the FTR 1200 S. That’s not super-light in the global scheme of things, but it’s light by the standards of American bikes. The new Indian is a little heavier than the BMW R nineT, which hits the same mark fully fueled. Length is 2287 mm, a fraction longer than both the Sportster 1200 and BMW R nineT. 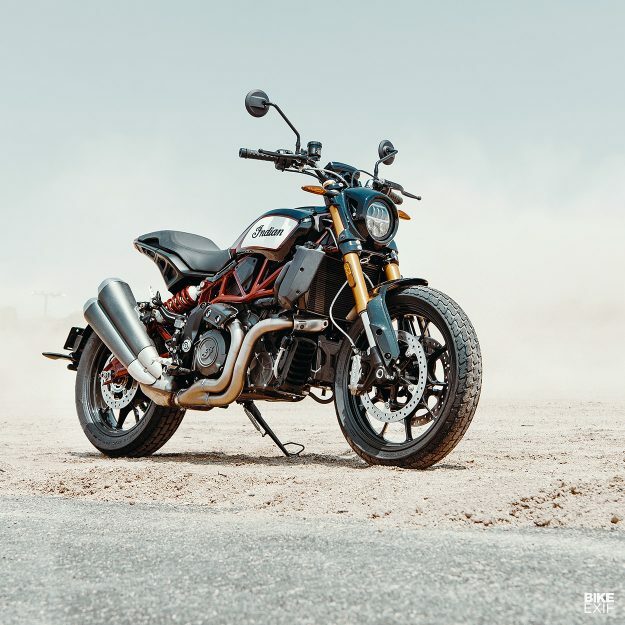 The FTR’s tank holds 13 liters of 91-octane gas, which is around four liters less than a Sportster 1200 Custom and a full five liters less than the R nineT. This suggests that a. fuel storage was one of the biggest issues the FTR 1200 production team faced, and b. they weren’t willing to compromise the lines of the noticeably sleek looking tracker. There’s no real, direct competition for the FTR 1200 though: it’s the first mainstream production bike to tap into the vogue for flat track tracing. 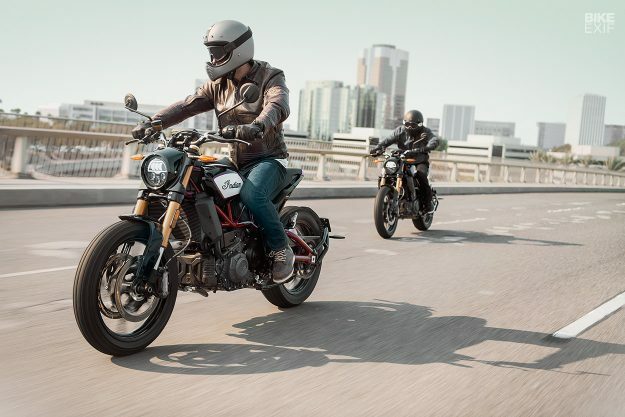 Potential buyers of the FTR 1200 might also be looking at the R nineT though, and will note that the BMW gives away ten horsepower compared to the FTR 1200—and costs substantially more in the US, with an MSRP of $15,495 for the German bike. 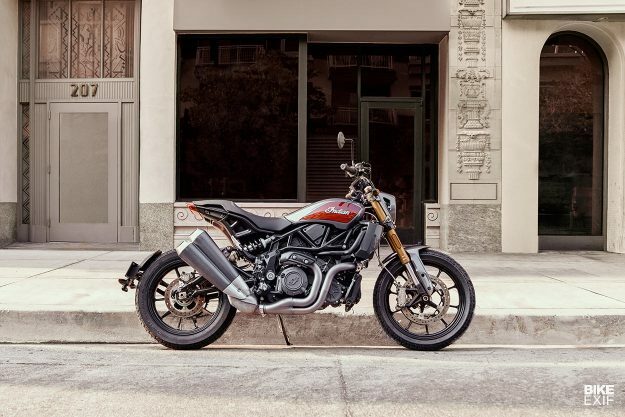 There’s nothing in the Harley-Davidson lineup to compete, although the impending Streetfighter may appeal to FTR 1200 buyers. And although Triumph is due to debut its Scrambler 1200 in three weeks, that model is likely to be more of a true dual-sport. 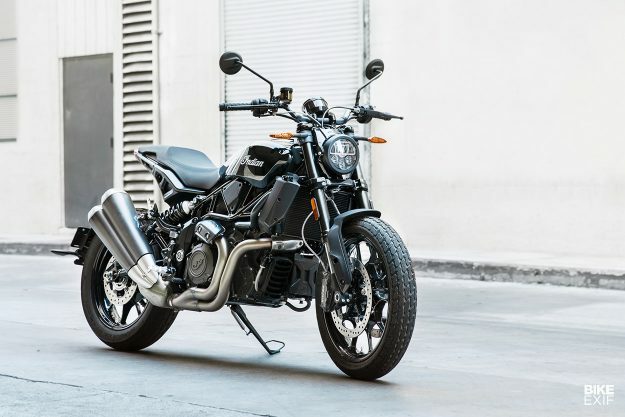 The FTR 1200 will go on sale “in the first half of 2019.” Test rides for journalists will be in the first quarter of the year, so we expect the FTR will roll into showrooms some time between April and June 2019. 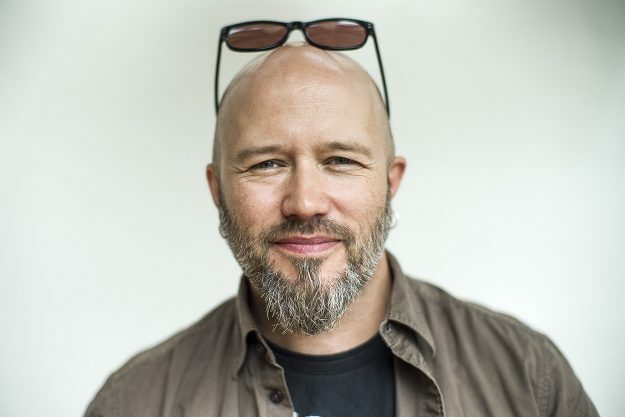 To dig deeper than the standard PR, we put some questions to Indian VP Grant Bester, and also to Ola Stenegärd (below), the former BMW designer who joined Indian as Director of Product Design six months ago. How ‘ready’ was the production FTR 1200 when the prototype was revealed? How much impact did the public’s response have on whether the FTR was going to go into production? Ola When the FTR1200 Custom was shown, the production bike was eating up miles on the test track. It was 95% finished, I would say. Yet we are very ‘open’ in the last months before production. Feedback on both the visuals and riding experience was being updated very close to production. I would say this is quite normal anywhere in the motorcycle industry. Of course, you don’t change the ‘big strokes’ a week before start of production. But fine-tuning is something that goes on almost until the bikes start rolling off the band.